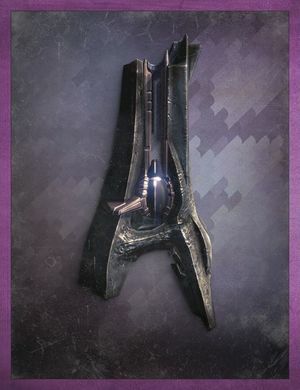 "This devastating Arc weapon is said to contain a shard of some dead celestial body. Lobbing bolts of rotting starfire, it is both a ruinous tactical weapon and an instrument of siege." A Boomer is a type of Hive weapon. It deals Arc damage and has a devastating splash damage effect. Like most other Hive related items, it screeches while in use. It is mostly used by Knights and rarely by Acolytes. This weapon has an astonishingly long range, and because of the splash damage, it can flush Guardians out of cover and suppress them with ease. A Knight wielding a Boomer.